Andrea Reese has appeared in numerous independent films, including Release with David Letterman and Caleb's Door, soon to be released. Stage roles include "Margy" in The Widow's Blind Date at the John Houseman Theater, co-directed by Israel Horovitz, and "Melissa" in Love Letters on Theatre Row. 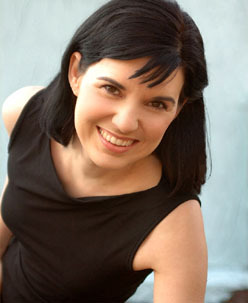 She has also worked extensively in commercials and industrials. After years of being told she resembled Jackie O, she wrote Cirque Jacqueline, a one woman show about Jackie O, which premiered at Bank Street Theatre March, 2002, as part of the Titans' Theatre Company season, followed by performances at The Corcoran Gallery, The Jean Cocteau Repertory Theater, The Bosakowski Theater, Crossroads Theater, and The Triad Theater. She is a graduate of Sarah Lawrence College and University of California, Irvine (MFA) and she completed a 2-year Meisner program with Jim Bonney in Manhattan. Her special skills include classical singing, drawing portraits, and middle eastern dance.